My biggest problem studying the Bible is making time. Multi-tasking is the word of the day, and I have found a way to make that work for me. I love to study the Bible while I am putting on my makeup. Sometimes I study while folding laundry or washing dishes. I’ve studied on the treadmill, in the car, on vacation, even soaking in the bathtub. Any mundane or mindless task will do. As of the end of May I will have completed my fourth time through the Bible, and very rarely have I been sitting down when I studied. 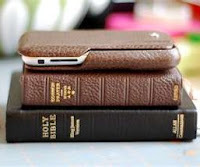 I listen to the Bible with the One Year Daily Audio Bible podcast (no, this is not an ad. If you’re interested, this is what it is and this is how I found it). Well, okay, I guess it’s not really “studying” per se, but the effect of having read any book four times through is that you notice things that you didn’t before. Stories gain context, characters develop nuance. Themes emerge and evolve. What has been a jumble of disparate stories becomes an epic adventure, chronicling the rocky relationship between God and Man from the dawn of time to the end of the age. The effect on me has been profound. I am not the same person I was. I am more. Everything about me has expanded (no waistline comments, please). My ears listen and hear better. My mind has clarity. My eyes see more compassionately. My Irish temper is tempered. My hands are gentler. My laugh is heartier. My mouth is kinder. My feet move more quickly to help. My heart is larger. My soul is fuller, deeper, richer. Sadly, what hasn’t changed is that I am still profoundly imperfect, but I think that this quality is here for the foreseeable future. But the best thing about studying the Bible is that the near stranger I decided to follow years ago has become my First Love. It’s not What I am learning so much as Whom… and He is definitely worth my time.